10k for Pink is the app I use for my Couch to 10k training. It is a fourteen week program, with the first eight weeks being the normal Couch to 5k program, so if you’ve already graduated from the Couch to 5k program, you would start with week nine. It is a pretty simple app. 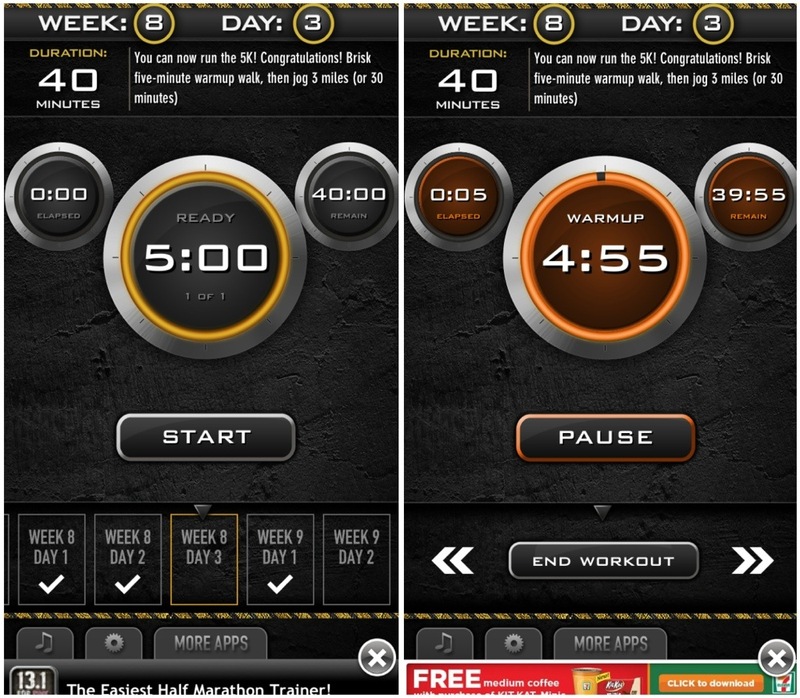 You select the day you want to complete, press start, and the app will audibly tell you when to warm up, walk, run, and cool down. You can control your music from it, as with most running apps. I usually start it and run it in the background, so it’s just click a button and forget it. If I’ve already warmed up before I start the app (so I can take longer than five minutes), you can easily skip ahead to the start. Sometimes I do workouts that complete one of the days without the app running. In that case, you can just double click any day to check it off. Also, I have the free version, but if you upgrade to the paid version of any of Zen Labs’ apps, they donate 5% to the Breast Cancer Foundation (hence the “for Pink”). Negative things? I’ve had one workout that had a typo and said I would be running 20 minutes, when I actually had to run 22. Also, make sure your phone isn’t on vibrate or the voice prompts won’t work. Otherwise, I’ve never had any problems with the app; it does exactly what it says it will do! I was mildly disappointed when I got it that the first eight weeks were Couch to 5k instead of a slightly more 10k friendly workout, but I am happy to have that base now, so we’ll see how weeks nine and on go! This entry was posted in Gear and tagged 10k for pink, couch to 10k, couch to 5k, iphone app. Bookmark the permalink.